Unlike others in the industry, all of our parts are individually cut, machined and powder coated in our very own state of the art factory powder coating plant, which means superior in house quality control as well as minimal exposed or unpainted edges that can corrode when exposed to the weather. We provide over 100 colours to choose from, as well as clear anodized a.k.a brushed silver. 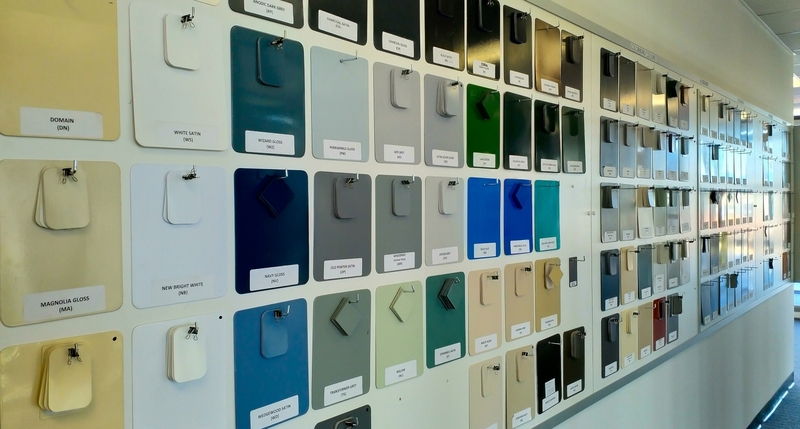 Most of the colours listed below are available as "real life" samples from our showroom, for you to take home and match up to your colour scheme. It is highly recommended that you obtain a sample from our showroom if you are concerned about the accuracy of your chosen colour! All colours subject to avilability from suppliers. Please note that the colours stated on this page are sourced from various suppliers and may change at any time without notice. Therefore we cannot show them directly on our website. Please use the colour charts available below to choose your colour and check their availability with Statesman Windows prior to ordering your products. The colours as seen in brochures are only an approximation of their actual "real life" counterparts. Statesman Windows cannot be held responsible for any mismatch of colour as the accuracy of any computer screen will differ to the real thing. Results may vary. * Denotes limited quantity available.